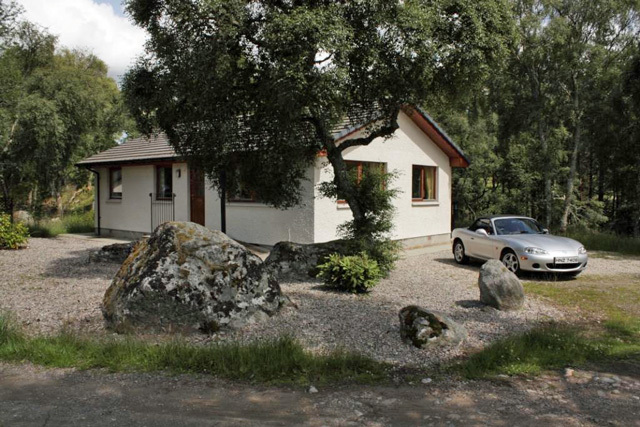 Self catering cottage, Pets welcome, Inverness, Scotland. 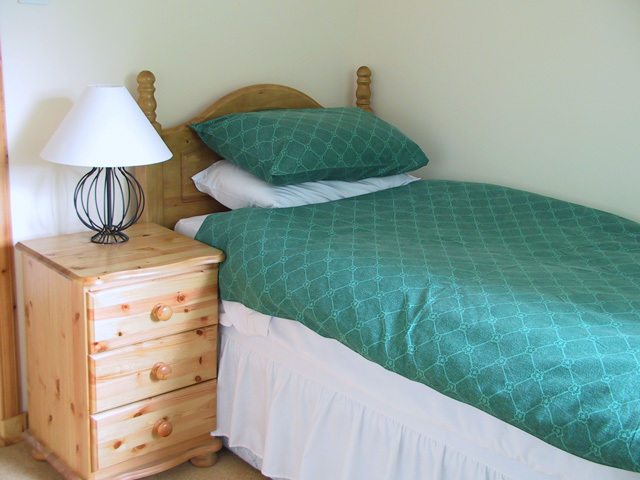 Sleeps 5/6 - Pets Welcome - Category 3 Disability Award - STB 4*'s - Green Tourism - Gold Award. Rowan Ridge is a luxury 3 bedroom self catering holiday cottage that has been awarded STB 4 star and a Gold award from Green Tourism. 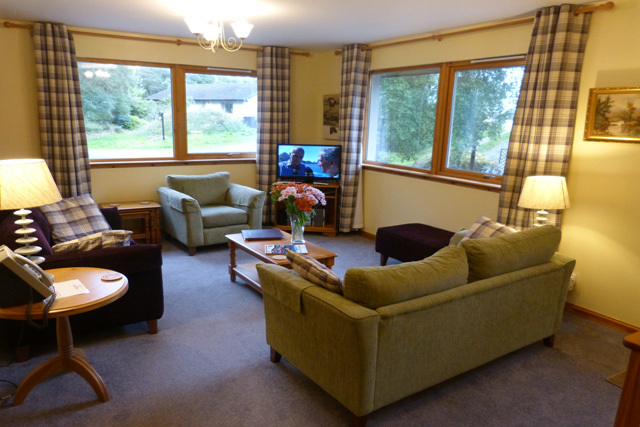 Situated on the 200 acre farm which lies amidst the picturesque Strathnairn valley, you are only 6 miles from the city of Inverness, 11 miles from Loch Ness and 26 miles from the skiing centre of Aviemore. Within walking distance is a well stocked shop in the rural village of Inverarnie. The property has superb views of the countryside and mountains and much maximum privacy. With superb views all round, much thought and care has gone into the layout and spacings of the cottages to provide maximum privacy and secure the best views of the mountains around. From the doorstep of Rowan Ridge you can access 3.5 miles of beautiful woodland and riverside nature walks. These connect into Forest Enterprise roads/walks allowing you to walk for miles into the hills (or mountain bike) on good quiet forest trails. Over a mile of river runs through the centre of the farm and passes just below the cottages. There is a wide variety of wildlife and birdlife with several RSPB reserves local to Rowan Ridge, including Loch Ruthven, the main breeding place of the rare Slavonian grebe. Golden eagle, red kite, osprey, buzzard, owl, hawks and woodpeckers, red squirrel and deer are frequently seen in this area. Choosing your accommodation close to the city of Inverness and Loch Ness, has numerous benefits. 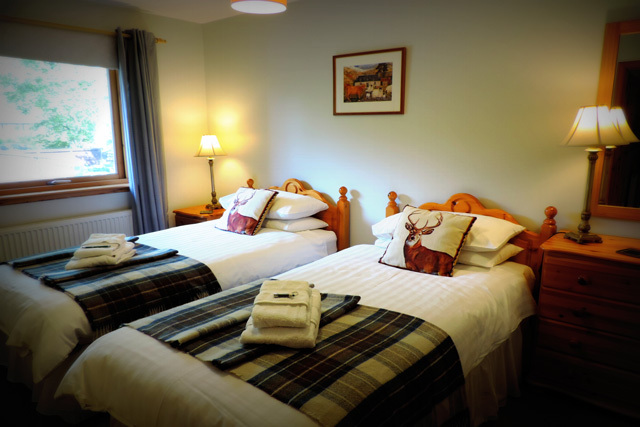 With excellent shopping and sports facilities within Inverness, Loch Ness cruises, many top class golf courses, Culloden battlefield, Moray Firth dolphins and a central location for wider tours in the Highlands and Islands, there reallisn;'t a better bse for your highland holiday. For winter visitors, this is an ideal base for a skiing holiday, with Aviemore only 30 minutes by car. 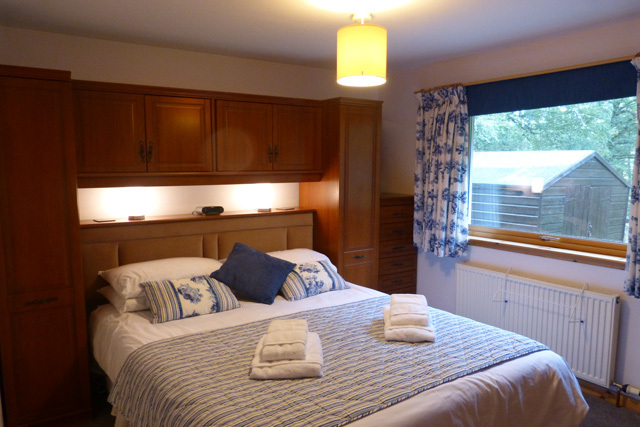 Rowan Ridge has a spacious lounge with freeview TV, DVD player, CD player with iPod dock, DAB radio, free Wireless internet access and a payphone. The large windows are perfect for watching the numerous birds that inhabit the birch woods. To the side of the cottage is a patio with garden furniture and barbecue. The large kitchen with dining area has an electric oven and hob, microwave, fridge/freezer, dishwasher, washing machine/dryer and all the kitchenware required. A large airing cupboard, iron, ironing board and clothes dryer complete the facilities. Three bedrooms - One king with en-suite shower. One twin and one single with a pull-out companion bed. Hairdryer provided. The family bathroom has a bath with a shower over. Table football in garden shed. Quiet seclusion in a woodland setting, only 6 miles from Inverness. The cottage was very comfortable and warm and had everything we needed. The enclosed garden was great as we had taken our young dog with us and we all enjoyed the lovely short walks just on the door step. Enjoyed a relaxing time at Rowan Ridge. Bungalow is lovely and home from home. Warm clean and tidy with excesses of equipment for the keen cook etc. Pretty walks within the farmland and river runs through walking area. Host very pleasant and friendly. Fresh flowers and tea and coffee on arrival after an 8 hour journey was a nice welcoming touch. My second time at Rowan Ridge and loved every minute spent in this superbly equipped cottage. An excellent situation for touring the spectacular Highlands. I hope to go back next year. Cottage well sited and well equipped. Hours can be spent just watching the birds at the feeders on the cottage patio area, and walking the very pleasant trails that are laid out alongside the river. The cottage itself was well kitted out (more so than our own home!) with a washer drier, dish washer, dyson vacuum cleaner and ipod docking station! Rowan Ridge could very easily become a home away from home, and if youve never seen Scotland, this is the way to see it. *Only one snag - if you are after seclusion, this may not be the place for you. The cottages at Davlourn Holidays are much closer together than the advert suggests - if youve forgotten to close the living room curtains before going to bed, put some clothes on before you look out the window in the morning! We recently returned from our second stay at Rowan Ridge (this one being our Honeymoon!) and again we thoroughly enjoyed our stay. The cottage is correctly rated at 4 stars. It really is a home from home with all the amenities you need and expect. It is very clean, warm, cosy and comfortable. It is in a wonderful location, set on a farm with coloured walks that cater for all ages and abilities. 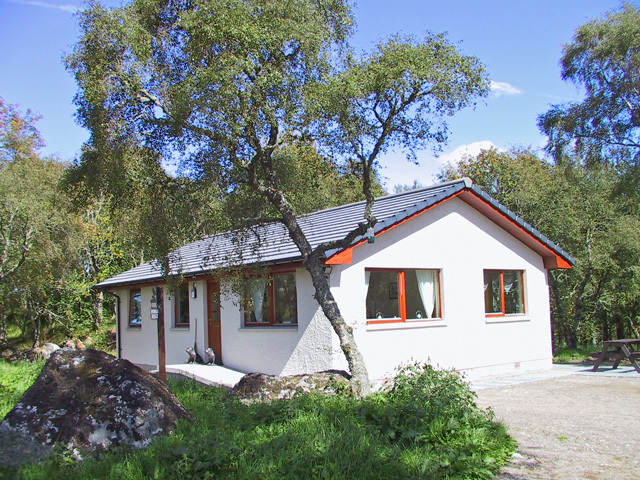 It is also the perfect base for those wanting to explore the area, being close to Loch Ness, Inverness, Findhorn etc. (Would recommend a trip to Foyers Falls & Findhorn Bay). All in all we had a great time and for early October, the weather was kind to us too. We have already recommended this location to friends so would have no hesitation in recommending to visitors to the Wilderness Cottages website. Lovely location, well equipped and very comfortable. Superb scenery and lots to do in the area. We had a relaxing and enjoyable time and our two dogs had a good holiday too. Very peaceful with loads of wildlife including many birds, deer and we saw a red squirrel ! Excellent booking arrangements led to our best ever self-catering holiday. 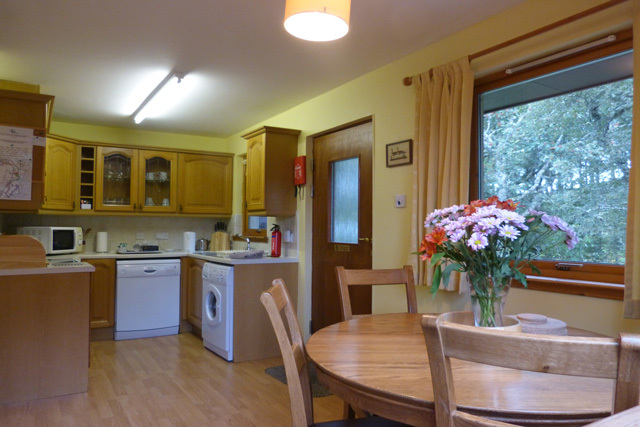 The cottage was well equipped and its location was perfect for us as keen dog-owning walkers. The cleanest and best equiped cottage we have stayed in and we have been in a few. Excellent for the dogs with well marked walks in easy reach. Central for most places in that area, ideal for birdwatchers. Will definately be going back. We have booked through wilderness cottages before,so we had very high expectations ,we were not disappointed.This cottage is first class in every way,we had a very relaxing stay,and our two boys,jack russels,enjoyed the well marked out walks,the only down side from our point was the walks were very restrictive.If you like birdwatching like us you will be in heaven look out for local peregrin,buzzard,and dipper down on the river.And don,t forget your fishing rod, as you will regret it. This was our 3rd visit to Rowan Ridge, everything about the place is fantastic, the accomadation thru to the setting, no fault can be found , its a real home from home, and no doubt we will be back again soon. Superb cottage, very well equipped, lovely and warm, great facilities, fantastic location and great after sales service as well. It may be an old cliche but it really was home from home. What more could you ask for! We were really impressed with Rowan Ridge. The cottage was really well appointed, beautifully clean and it was lovely to see the birds close up on the feeders - great to see siskins in summer as down south they only visit in winter! Super area for birds generally, with Slavonian Grebes and a passing osprey seen at nearby Loch Ruthven. There are good walks along the Caledonian Canal, worth visiting Nairn and Culloden, and a day trip to Orkney is not out of range - though you may prefer to drop off in Kirkwall rather than do the "highlights" coach tour on top of three hours in the coach to John O Groats and three hours back ! and the trip on Loch Ness in the Royal Scot from St Augustas well worth the money, ?8.00 for all that!! wow. If I get the chance I will be back. We had a fabulous time at Rowan Ridge. The cottage could not have been better. It was equipped to the highest standard and extremely comfortable. Our two American friends who stayed with us were truly impressed. The location was excellent for touring as our mileometer will testify to the 2000 miles we clocked up enjoying trips to John O Groats and the Isle of Skye. Many thanks for providing a warm, cosy and welcoming cottage in a fantastic location. We all really enjoyed our stay, the dogs included, and hope to be able to find time to come and stay again in the near future. The walks from the doorstep make it the ideal location with the dogs.